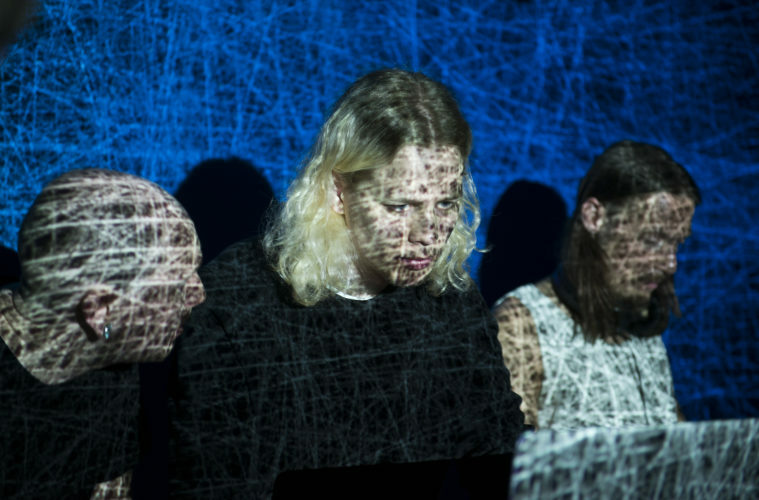 The Norwegian techno collective /grå is quite ineffable and elusive. Not only is it hard to track down on the web, but it is also hard to describe. A collective, comprised of 15 or so, mostly formally educated musicians, provides new meaning to the concept of a live Techno set as /grå incorporates traditional instruments into their improvised performances. After the collective made an appearance on the national Norwegian radio station last month, Monument decided to catch up with Stian Balducci aka +plattform, a person standing at the forefront of the collective. We talked to Balducci and Simen Løvgren about the concept behind /grå and why it was such a natural development in the Norwegian musical landscape. A rather blunt question to start with – what are you? How would you describe what you do in a sentence or two? Simen: We don’t have a good elevator pitch. We want to sound like a DJ, even though we are a lot of people, some of whom are playing traditional instruments. We want to improvise, but it should still come through almost as a track played by a DJ. How would you like to be referred to? As a Techno ensemble? Stian: Yeah, actually that is pretty on point. You said it almost as a joke, but I think that suits us, we are so many people involved, and too big and fluctuating to be called a band. Usually not more than 5 of us play at a time though. You don’t have a fixed composition of the collective? Stian: Well, /grå is both a group, a musical collective as well as an event. We do /grå club nights and switch up who plays each time. It’s based around a core of people who are central for the project, but those people turn out to be many. Another long-term goal is to create even more dialogue with other musicians. In December we have invited Albert van Abbe, a great producer and a DJ who is releasing on labels like Semantica and FIGURE Jams, to play with us. For next year we have spoken with a few key Norwegian musicians who will join the madness for the first time, too. So you are a big bunch. Where is the core of /grå based? It is hard to figure this out, as under the only recording that I found online it says you are from Finland! Simen: Oh yes it says that? It’s a mistake. We are all based in Norway (with the exception of Albert), mostly in Kristiansand and Oslo. How did you all get together? Do all of you have formal music education? Stian: We met in the conservatory in Kristiansand where Punkt Festival is based. It focuses on the concept of live remixing, so with the help and encouragement of the exceptional musician and teacher Jan Bang we got started with Punkt Klubb which was a kind of afterparty for Punkt. We did our thing on a monthly basis at Vaktbua in Kristiansand for a few years, as well as a few one-offs in Oslo. Bendik Baksaas and Kjetil Jerve, who are both from the Academy of Music in Oslo, soon joined on a permanent and very engaged basis and we got a steadier connection to Oslo. With that came the nights at Blå. So yes, we are all musicians with a formal music education. So far, what traditional instruments have you played along? Are there instruments that are too hard to incorporate into your set? Or instruments you look forward to play with? Stian: When playing on the radio earlier today we had trumpet, keyboards and three guys on electronics. We also have a couple of guitarists, drummers and a bass player involved. The drummers don’t use the entire drum set, the kick drum is not allowed. We don’t want after-ski style “DJ and drums” doubling of the beats. I think this is sort of key for everyone involved. It is a lot about reducing your output and thinking a bit differently from what musicians traditionally do in band situations. The bass player needs to consider his frequency placement very carefully, and the guitarists are laying aside their riffs and chord progressions in place for, again, more sonic thinking. We have also used vocals and had a singer on board for a while. Simen also sings. The voice is tricky though, as it’s so familiar and the same principles mentioned above are the key. Simen: When I sing, it is so processed that it doesn’t represent a lead vocal role anymore. It’s clearly melodic, but it sounds as if it could come from any sound source. In the future I think it would maybe be fun to try Violin. Stian: I think it’s more about the musicians, rather than the instruments. Simen: True, I think just about anything could work if you’re a musician with the right kind of ear and musicality for the project… anything could work. What does your set involve? Are you using existing tracks, mixing them and then traditional musicians play on top – or do you start from a drum beat and let that guide your journey? Simen: We often start without any pre-programmed stuff. If we are playing with a guitarist, I get a line into my setup from the guitar, like a copy of his signal, I sample parts from this and mold it into something else. Stain: We don’t mix existing tracks, at least not fully. We do, however, make short loops from existing music, from others and our own, and use lots of that. Every electronic guy has a different approach though. Simen does most of his stuff from scratch on the spot. Even has lots of prepared small things, Bendik programmes on machines. I do sort of a mix, one computer is for live-sampling, building and creating stuff from scratch, the other pipes out beats to a mixer – sort of in a DJ-fashion. That way we can quickly get proper and thumping low-end. Programming a drum machine and a synthesizer is cool, but I think produced elements often sound better. Basically, there is no dogma for keeping everything created from scratch on the spot. The dogmas are musical, rather than technical, I think. Do you have a clear role division? Stian: The electronics always do the beats. The kick and bass-groove thing is always one person at a time, and others can add in hi-hats and percussions. Then we switch who controls the kick drum during the set. Guitars are encouraged to take on a glue role, the same for the trumpet, meaning long, slow and melodic movements. Also, the keys often do either pad-like things, percussion-like bleeps or even full-on riffs. Basically there are roles, but they change, and everything is quite fluid as long as only one person is doing the kick at a time. The electronics are usually also working the master mixer, and we have talked about one person being able to control and mute stuff on it, too. Say, someone controls the mixer, and everyone knows he has control today and you might get muted during the set any time. It would be interesting to see if one person’s overview of the music might add something. Like, I know that I want to go from here to there, so I’ll just take control. However, socially it’s a bit tricky. At the moment the best approach is that we talk things through before, and make sure that we all want to push it in the same direction. So you don’t actually have a planned set at all? Simen: No, but we have rules. It’s about playing as little as possible, because it gets messy quick. We try to preserve techno aesthetics. Do you still meet to rehearse for that specific upcoming event? Simen: Yes of course, but it is more for just like getting our mindset in sync. We rehearse, but it does not sound the same at rehearsal as it does live, at all. That must be tough! For me, a good techno set is about it feeling like a journey you are taken on. I feel like it is important that there is continuity and a vision, where the listeners are taken. Stian: Absolutely, and sometimes it does indeed just fall apart. Our goal is to get to that place where everyone in the group is a part of the journey and in that sense there is no leader. Stian: Yes, but that is sort of an important part. All the people involved are good musicians who do extended jazz, improvisations and stuff like that. We are used to unfolding the story in the now. What is the ambition behind /grå? Do you think of it as some sort of a movement of electronic music – a revolution even? Would you like for this initiative to spread and perhaps take over? Stian: I think it feels futuristic and novel, yet at the same time we are sort of like a jazz-band from the thirties, but playing for a dancing audience. We are certainly not trying to start a revolution, and good old DJ’ing is still on, but I think we are providing a healthy addition, or an alternative take on the same musical ideas. Would you say that thanks to jamming together and the Punkt Klubb the development of /grå has been organic? Or did it all start from the thought of techno sets being too rigid and lacking improvisation? Simen: I think Stian had the idea for a while. Stian: My main Live output has been playing together with people in different improvisational situations, whilst my main production output has been on the techno side of things with +plattform, so it made sense to merge the two. Punkt Klubb and /grå are essentially the same thing, so it began as the former, with all the live sampling madness that comes with that angle. With time, it changed to /grå to connect it to my label Gråtone. When considering the caliber and output of musicians, it also feels like a very natural thing to do in Norway. Why did the development of /grå feel natural in Norwegian context? Would you like to expand? Stian: In Norway/grå feels logical, and it falls under a long tradition of experimentation and intersecting genres. Without any intention of being patriotic, I’d say that Norway, with a very healthy and thriving scene, is the home to some of the best improvising musicians in the world . It only makes sense to do the club thing with their input. There is this long lineage going back to Garbarek and his peers who established the Nordic jazz. With time and new people chiming in, eventually the electronics and sonic exploration took serious hold and became commonplace. I mentioned Jan Bang before and he and his peers are sort of the second generation following that lineage. Nils Petter Molvær’s Khmer record from the 90’s on ECM was more or less a house record. A few years back he also did a record with Moritz von Oswald who is half of Basic Channel. Pål Nyhus/ Dj Strangefruit has repeatedly played records together with jazz groups. In the 90’s, before my time, there was a club called Jazid where they mixed club music and jazz. I mean, I can go on for a long time. Bugge Wesseltoft works with Henrik Schwarz and Eivind Aarset’s older records are very electronic. Basically, we are just following along in a long tradition. The difference is, however, that we do it from a more clear-cut technoid perspective than before. How do you feel you fit in more specifically in the context of the Norwegian techno scene? What is the scene in Oslo like? Does your initiative feel welcomed? Stian: Well. I guess the scene in Oslo is growing in a healthy direction. Newcomers are producing more than their older counterparts, and it seems like the gates are opening up for these people to get in to the game and show their stuff more so now than ever. The scene is still small, and the clubs and venues generally do club music in different forms and genres. 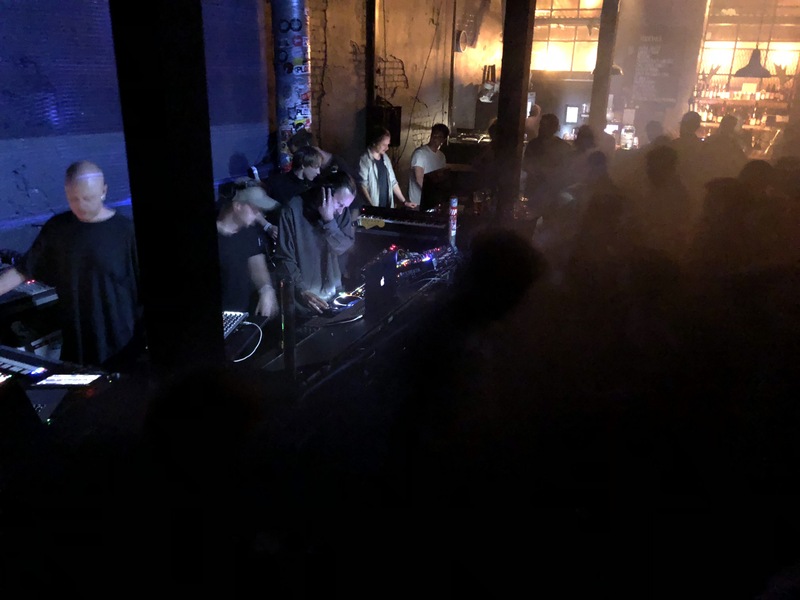 There is not a single club that does only techno, and a lot of the club music coming out of Oslo is perhaps a bit more eclectic than international techno standards allow. The fjord disco or Oslo disco, or whatever you want to call it, has been a healthy thriving scene with producers and DJS side by side for years, and now it feels like techno is catching up. To be honest, I think /grå fits in quite well. We are not directly competing with anyone, and we provide an alternative, yet firm take on underground techno. I mean, it makes sense, and it’s also a place where people from different audiences can meet as it feels perhaps less constricted in terms of social norms etc. How are you received by the Oslo’s techno audience? Do you feel that the audience is comprised of more music geeks rather than the usual techno audience? Simen: There are people coming who aren’t within the scene. We see lots of musician-friends at these nights, people who work with completely different genres. Sometimes it can be a bit confusing for the audience and there has been times when they stand around as if it’s a traditional concert. But we really prefer people dancing and having fun like during any techno set. The music never stops, so after a while everyone usually gets with it. It also helps that we, the musicians, take breaks. It instantly becomes less formal when you see the drummer going to the bar whilst the music is still playing. Stian: I think a good mix of people show up. Techno freaks, music geeks, musicians and curious people in general. The concept and constellation of musicians might also make the music more accessible for outsiders. I was out with a childhood friend who isn’t into electronic music or techno at all and he asked me if the DJ was making the music on the spot. Basically, the concept of going out to see someone play other people’s music was very foreign to him, and seeing live instruments and people working out the music on the spot is probably more familiar and relatable for a broader audience. Maybe also having done a show on the national radio will attract a slightly different and less techno-oriented audience, we will have to see. Where have you played, and what was your favourite venue? Where would you like to play? Stian: BLÅ in Oslo works very well. The acoustics and our positioning in front of the PA makes for great listening and decent sound. 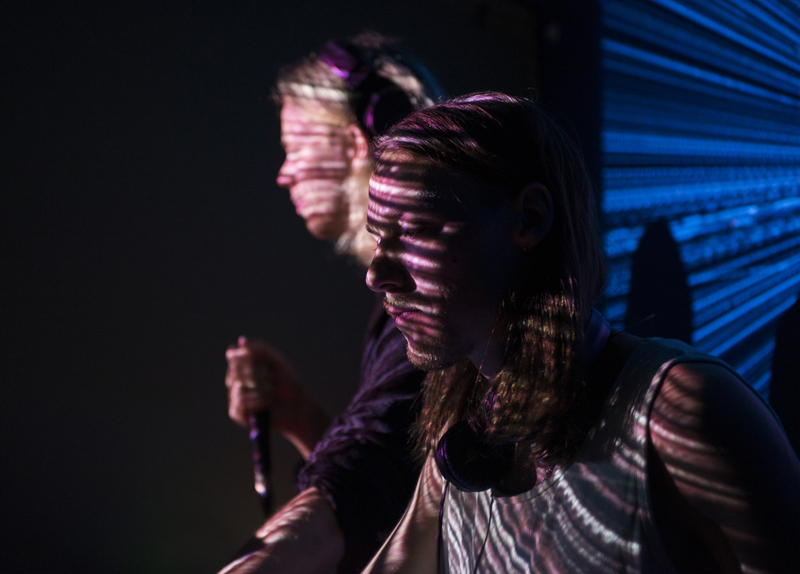 In terms of where we’d like to play I think /grå would be a great fit for festivals that are focused on electronic music and art, but also book bands. Sonar, Atonal, Intonal and Insomnia to name a few. Are you planning to release at all? Stian: Yes, there are records coming up on Gråtone. Simen: We run everything through a large mixer with separate digital recording for each channel and record every set. This is then reviewed and edited to fit your typical 12″ EP. Stian: Three or four tracks from each night, focused stuff.